Varanasi: His writings have been hailed and admired by a vast section of readers who have taken Hindi literature to heart. And if one happens to have visited this ancient Hindu pilgrimage centre even once, Kashi Nath Singh’s book Kashi Ka Assi is bound to bear a resonance that is as resplendent as the all-encompassing charm of the many ghats (fortified river banks) of this high-profile constituency in Uttar Pradesh where the Bharatiya Janata Party’s prime ministerial hopeful, Narendra Modi, is one of the candidates. While Modi’s high-voltage presence has brought Varanasi under the media arc lights like never before, for old-timers and sworn Kashi (Varanasi) thoroughbreds like Kashi Nath, the Gujarat chief minister’s presence goes against the very spirit of Varanasi and its pluralistic cultural make-up. 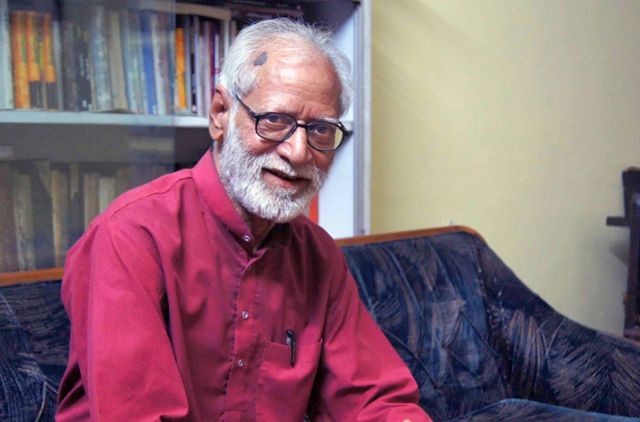 Kashi Nath, a former head of the Department of Hindi at Banaras Hindu University, rues the fact that this election is already taking its toll on Varanasi’s image as a socio-religious and cultural melting pot. He strongly believes that a fair bit of polarisation has already taken place among the voters and that is not good news for this ancient city. Is there a Modi lehar (wave) in Varanasi? Let me tell you, koi lehar nehi hain (there is no wave at all). All this talk about a Modi ‘wave’ is a creation of the media with vested interests. What kind of a message does Narendra Modi’s presence as a candidate carry for the people of Varanasi? The only message that the BJP’s prime ministerial candidate has managed to convey is one of divisive politics. Modi’s presence has polarised voters and that is my biggest worry. Why is this a matter of concern? People of Varanasi have lived in relative peace and harmony for decades. Varanasi has a very rich tradition of communal harmony. Despite being a major Hindu pilgrimage centre, this place has welcomed people from various religious backgrounds with open arms for centuries. Now, with Modi as a BJP candidate, his overt pandering to Hindu religious sentiments and with his party demanding an abolition of Article 370 that grants special status to Kashmir, there is a strong possibility of an element of distrust and discord to permeate the membrane of Varanasi’s social harmony. Which way do you think will the Muslim vote go this time? I have a feeling that the vast majority of Muslim voters are yet to make up their minds. They will wait till the last moment and see who emerges as the strongest bet against Modi and will go with that candidate. It will most likely be a toss-up between Congress candidate Ajai Rai and Arvind Kejriwal of Aam Aadmi Party. If you ask me, I think right now, Kejriwal has a better chance of consolidating the Muslim vote in Varanasi. Rai, despite being a local resident, has some past issues to sort out and his candidature has not evoked the kind of interest that one would have expected to see. Let me tell you very honestly, if at all some Muslims in Varanasi vote for Modi, it will be more out of fear than anything else. His talk about development in Gujarat is backed by media blitz. There is more hype than substance in his claims. Moreover, he has not said anything about Varanasi’s development. Look at the crumbling infrastructure, poor drainage system, horrendous traffic scenario in this place. Even the river Ganga is so terribly polluted. Has he said anything to address these issues? Has he even bothered to mention what all he wants to do for the people of Varanasi, should he get elected? Are you worried about poll violence? There is every possibility of things taking an ugly turn on or just before election day. Again, it all depends on BJP. If the party senses an overwhelming outpouring of support for its candidate, things are likely to stay calm and the polls should pass off peacefully. However, if the saffron brigade has even an iota of doubt about Modi’s prospects in this constituency, it is certain to reveal its fangs and scare away voters of the rival camp. There has already been an influx of outside elements in Varanasi over the last few days. BJP has amassed its workers and active supporters from all over India to ‘manage’ the election here. And things can reach a flashpoint with the slightest of provocations. I can’t visualise him as a good prime minister. Till date, he has not apologised to Muslims for the 2002 Gujarat riots. How can we entrust the responsibility of running a secular nation like India on such a person? Moreover, one cannot trust BJP. It can make an issue of Article 370 or Ram Mandir (temple) at an opportune moment.